Home» What Colour Advent Candles Should I Buy? This year, Advent Sunday is on Sunday 2nd December, a date which is rapidly approaching! For many churches, this is an opportunity to pause and reflect as the first of the advent candles are lit. The lighting of candles on an Advent wreath was imported into Britain from northern Europe in the nineteenth century, and is now a common practice. As with many Church celebrations, variations of this celebration are dependant on tradition. 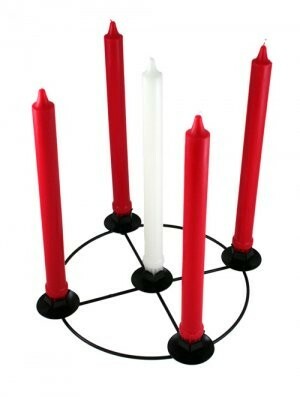 The Advent Wreath has four red or blue candles in a ring around a white or gold candle. Alternatively, there may be three purple candles, reflecting the liturgical colour for Advent, with a pink candle for the Third Sunday, when rose-pink vestments are traditionally worn. Traditionally purple is used as the main colour of Advent, which is used for the first, second and fourth Sundays. The first candle represents expectation, the second love. On the third Sunday of Advent (Gaudate Sunday), rose pink represents the joy of the shepherds on receiving the Good News. The fourth purple candle symbolises peace. The final candle is white, representing the birth of Christ. The white candle always represents Jesus and is lit on Christmas day. The Fourth Sunday, where the Virgin Mary is remembered either has a red candle or a pink candle. 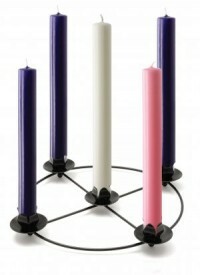 The pink candle is more commonly used within Catholic Churches and some Anglican traditions. Week 1: Purple –The Candle of Hope – This candle reminds us that God keeps His promises. He promised a Savior, and He sent one. Week 2: Purple – The Candle of Preparation – This candle reminds us to be prepared to receive the Lord. Week 3: The Candle of Joy – This candle remembers the multitudes of angels that joyfully announced the birth of Christ. Week 4: The Candle of Love – This candle represents the love of God. It was out of His incredible love that God sent His only Son Jesus. Week 5: The Christ Candle – When this candle is lit on Christmas Eve, it symbolises Jesus Christ, the Light of the World. Advent Candles are limited and selling fast get yours today from our Advent Shop today!